Why in the world would you "throw away" your life by joining a religious community? Don’t you want to fall in love and get married? Aren’t you afraid of being awfully lonely? Well, if you think you have to become a religious, why are you going to waste your life doing nothing in a cloister? Isn’t that a bit selfish? If you are honest, you might have to admit you have asked these questions and perhaps many others. I admit that I too had these questions. In fact, at one point of my life I adamantly told my family: “If Fr. Ritter thinks he is going to get me into a convent, he’s wrong!” You see, I was running from the Lord. I was bargaining with the Lord. I did not really know Jesus. I only knew about Him. I had not yet experienced how much He loved me and how from all eternity He had a plan for my happiness. I grew up in Louisville, Kentucky, the 2nd oldest in a family of 10 children. 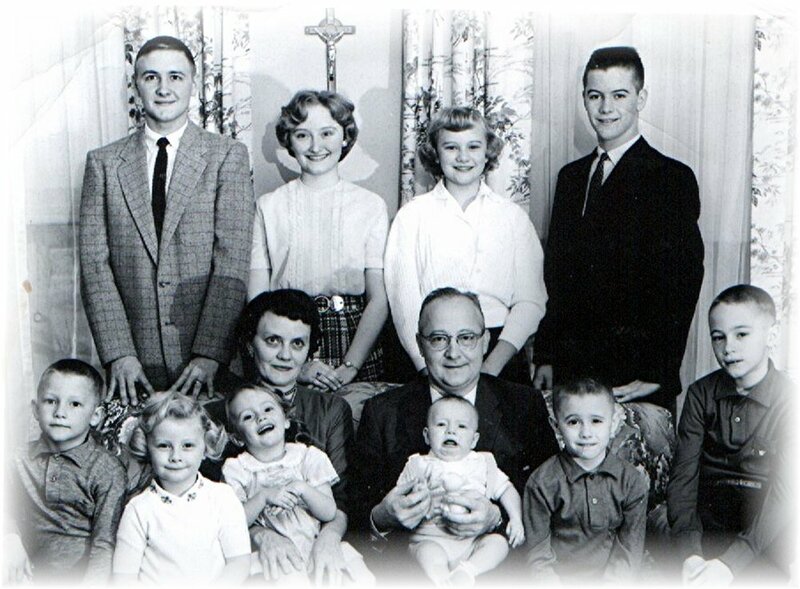 My parents were Ed and Cassie Schuhmann, and we lived in what could be called a "Catholic culture," where life centered on family and the parish. Mom and Dad were people of lived faith, and were generous in devoting time, talent and treasure to the works of the Catholic Church. Over the years, I have often reflected how true it is that the faith is more "caught" than "taught." It is certainly true in my case. God has known, loved and called each of us from before the foundation of the world, and assigned each one with a particular vocation, be it priestly, religious, married or single. In His amazing providence, He works on us as a unique and unrepeatable "tapestry", patiently weaving multi-colored threads into the "work of art" for which He created us. Looking back now in the 50th year of my monastic life, I can trace many of the threads woven throughout my entire life, threads He is still in fact weaving: prayer, love for the Church and family, devotion to the Passion and to our Blessed Mother and so forth. Here is an account of the way this has played out in my life. Just from the way my parents prayed, I learned at an early age how real God is, that it is easy to pray to Him, that He hears us as a loving God. Many times it seemed that God was especially close when we prayed together or attended Church together as a family. But that was not always true for me, especially in my teen years. After our family meal prayers, we always added: "And may God grant our family a religious vocation." Many were the times I said in my heart: "And let it be my brother!" Or, as I got bored during the family rosary after supper, I would get up and start washing the dishes! My parents simply kept on praying. I remember Mom sitting at our big kitchen table late at night, saying prayers from her Fr. Lasance Prayerbook. I was in awe of Mom’s book of prayers, but I don’t think it made me want to say such long prayers! From as far back as I can remember, my Dad was a daily communicant, getting up very early to go to Mass and then return home for breakfast before leaving for work. Mass on Sunday was as much a part of our life as was eating a big Sunday breakfast together. Mom had a blackboard out in the kitchen, and on First Friday she would have a reminder to receive Holy Communion. She also reminded us via the blackboard that it was time for our monthly confession. During grade school, Dad and Mom always made sure we memorized the catechism answers. How often the dining room table was our study table, with Dad and Mom right there making sure we did our home work. Dad had a way of getting us excited about learning our catechism. When my brother Eddie made his First Communion, Dad was so excited that it made me hardly able to wait until it was my turn. Two years later, when my time came, I remember very well all the school preparations of the Sisters of Charity of Nazareth at Holy Name school for our First Communion. Then right before the big Sunday itself, the pastor, Msgr. Timoney, visited our class and in the midst of his talk, asked how many of us girls wanted to be religious sisters. Nearly every girl in the class put her hand up. At that he said, "Oh, at the time of First Communion, every girl wants to become a sister, but later on, you won’t." I remember the great determination with which I said to myself, "Father, you are wrong. I really do want to become a nun." Although I can’t be sure just when the desire first came to me, I know that long before 2nd grade, I knew without a doubt that God was calling me to religious life. Many were the times, however, that later I conveniently rationalized this thought away. The Sisters of Charity of Nazareth were dedicated not only to imparting knowledge but also to forming the character of their students. I remember my second grade teacher telling the girls that we should keep our souls as pure white as our First Communion dress, avoiding at all costs a mortal sin. I remember making up my mind never willfully to offend Our Lord by mortal sin, and I will be eternally grateful to that teacher for imparting this to her students. There is no doubt in my mind that the first seeds of a religious vocation were planted in me by Dad, but this call developed gradually. My father had a deep respect and love for the Sisters of Charity of Nazareth and knew many of them by name. He talked to us kids about what a wonderful vocation they had—dedicating their whole life to God. Dad never talked about it as a career, but as a total dedication of oneself to God. That made me want to do the same. Dad also had a tender devotion to Our Blessed Mother. At St. Xavier High School in Louisville, Brother Silvan, one of his teachers, had taught the boys to make rosaries. Dad made countless rosaries in his lifetime. Once he told me that he made one each day, and while he made it, he would pray it. His devotion to Mary rubbed off on me, and was further nurtured by the Sisters of Charity throughout my school years. At the time, I don’t think I realized the gift Our Blessed Mother was giving me in a few special events that I did not seek on my own: In the 2nd grade, I was chosen by lot to be the girl who would carry the crown of Our Blessed Mother in the school May Procession. In that same year, I was chosen to play the part of the Blessed Mother in the Christmas play. Mom patiently drilled me on my script, and it is astonishing how I had no fear of stepping forth to do this even though I was extremely shy. In the 8th and 12th grades, I was so blessed to do the May crowning during the school May processions. Little did I realize that Our Blessed Mother was gradually forming the heart of a future Passionist Nun who would spend her life beside her at the foot of the cross. When I was in the 4th grade, Dad’s brother, Fr. Henry Schuhmann, was ordained and celebrated his first Mass. Father Henry was the godfather of several of us in our extended family, and so his godchildren were all given a part in his first Mass. There was to the "bride" (symbol of the Church), and two bearers of the bread and wine, I think. 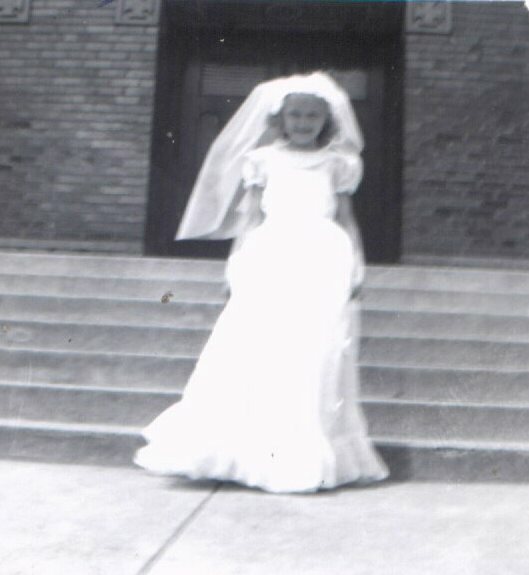 Since I was chosen to be the bride, Mom had to work for months making my long white dress and veil, which were of white organdy. With painstaking care, she made lovely small flowers for the dress—each one made of white organdy rolled around a wire to form a flat open blossom. I remember the huge impression the solemn ceremony made on me. I was also impressed by the holiness to which a priest is called. Great was my joy later in life when the Church sent a letter to all contemplative communities asking them to be "spiritual mothers of priests" by their prayer and sacrifice. In the 5th grade, when I began to play the organ for school Masses (which at that time were each day before school began), I became a daily communicant even during the summer. Although I cannot say I relished having to get up so early during summer vacation in order to play the organ, yet I am deeply grateful to God for these many Holy Communions. Because I had to play the organ, I had to attend Church functions. Our Lord knew I was too lazy and worldly to go otherwise. This penance turned out to be a protecting grace in my faith development. I attended Tuesday night novena devotions, and during Lent, the Friday night Stations of the Cross, and thus began my devotion to the Passion of Jesus. Over my bed hung a picture of Jesus Crucified with the word "Sitio" (I thirst) at the bottom. This holy image became a "presence" in my bedroom, and I often prayed before it. In the mid-1950's, "The Miracle of Fatima" movie was released. Some of my classmates and I went to see the movie and we were all deeply moved. I wept so much at Our Lady’s message that the whole front of my blouse was wet. I felt Our Lady’s presence strongly, and realized how important her message is for our era. That was a turning point in my life. After seeing the movie, I wanted even more to give my life to the Church as she moves through this difficult years. I knew I would be a religious Sister, but didn’t know exactly which community I would enter. Nor did I really think too much about it at the time. Apparently Dad did a lot of printing for the different religious communities in Louisville. The Passionists were one of them. For a while, when Fr. Vincent Mary Oberhauser, C.P. was the editor, Dad printed the Passionist magazine, copies of which we still have in our monastery library. Once when he had a delivery to make to the Passionists, he piled a couple of us kids in the car after supper and drove up to Sacred Heart Monastery on Newburg Road. As soon as we turned into the entrance drive, there was this sense of holiness that reached out and embraced me. I didn’t know then what it was, nor did I ever dream that I myself would one day become a Passionist! After my entrance into the monastery in 1961, the novice directress showed me the Schuhmann Printing Company wrapper on a set of our rule books. Dad must have printed our holy Rule! I was astonished at the providence of God. As I have been trying to show–the grace of my vocation developed gradually as I grew up. After viewing the Fatima movie, I realized the great value of prayer and making small sacrifices. My mother already had this beautiful disposition. Whenever anything was hard for me, and I was complaining to her about it, she would calmly say, "Why don’t you offer it up?" I began to get much more serious about prayer, and I started reading Catholic magazines and periodicals that kept me abreast of the challenges facing the Church, and particularly, the threat of militant atheism. There was a sense of urgency about Mary’s call to me, but I was still enjoying life in many ways, and so didn’t worry too much about my life’s vocation. Unfortunately, in about the 7th and 8th grades, I turned my back completely on religious life. I was too fascinated by boys and having fun going to parties and the like. All this time, Jesus was watching me and patiently waiting. He had set his heart on me. Scripture says He has chosen us before the foundation of the world, and He calls us even before we are formed in our mother’s womb. Jesus wanted me for his own but I no longer wanted to belong exclusively to Him. You see, I thought that if I gave myself completely to Jesus, I would somehow miss out on all the happiness and love I wanted in life. Afraid of being cheated, I didn’t yet know how Jesus alone can satisfy the deepest longings of the human heart. But a faithful God was watching over me. When I got into high school, in order to help pay my tuition I got a job as a parish organist at St. Philip Neri Church about a 20-minute drive from our home. I would play the early Mass there and then go the rest of the way to Presentation Academy in downtown Louisville. The possibility of a career as a musician began to open up for me. I had been playing the piano since the third grade and the organ since the 5th. Music was very much in my father’s family, and we had inherited my grandmother’s grand piano. Often on Saturday afternoons I would practice for three hours straight, besides one hour each day. My senior year recital piece was 16 pages long in 6 flats. During one of my high school summers, I competed and won together with other students in a statewide piano competition to play the piano with then-famous Liberace in the Coliseum of the Kentucky State Fair Grounds. Besides training in piano, Presentation Academy also provided me training in directing the school’s three large choral groups: the Allegro, Bel Canto and Choral Clubs. At a retreat during my senior year, I was chosen to direct the singing of the entire student body of close to 1000 Catholic girls. Probably everyone thought I would major in music in college. My piano teacher even offered me a college scholarship in music. During the first two years of high school, since I was happy and busy, I avoided the thought of religious life. Life was exciting and I had made new friends, but I was restless deep down in my heart. There was this emptiness inside that kept gnawing at me. It was as if I was always looking but never finding what could really satisfy my heart. My restlessness continued until one day the summer before my junior year, amid lots of tears I said to Jesus: "I surrender. I’m going to be a nun." His love had finally broken my heart. I finally realized that my vocation was to be totally His. That day, I gave my heart entirely to Jesus. I told Him I would be His bride. I had known for years that He was inviting me to be His bride and His helpmate in saving the souls for whom He died. Why had I waited so long to say "yes?" Why had I been running and stalling for time?? I think I was afraid that if I had only Jesus, I would miss out on so much else! How wrong I was! Once I surrendered to the "Hound of Heaven," I thought about becoming a missionary sister. I wanted to give up everything, even my country, for Jesus, and to spend my life bringing as many souls as possible to Him. God truly did want me to be a missionary, but not in the way I first thought. About this time, a teacher at my school gave me the autobiography of St. Therese to read. There I learned that a cloistered nun was actually a missionary to the whole world. Her mission field was not limited by time and space. A cloistered nun could be everywhere, she could work for Jesus everywhere—by means of prayer and sacrifice. This became my great desire. It surprised even myself, because just two years before that, I held the opinion that cloistered nuns lived selfish lives in "ivory towers". I felt they were wasting their time and should "get out here and help us save the world!" How totally wrong I was! I learned that St. Therese is co-patroness of the missions along with the active missionary, St. Francis Xavier, even though Therese never set foot outside her cloistered monastery! I began to think of entering the Carmelite monastery in Louisville, but although Carmelite spirituality greatly attracted me, somehow I just didn’t feel called to their life. Slowly I realized that what I was looking for was a community devoted to Jesus in the mystery of His love---that is, in His passion and death. Then one summer day I was out at a country club with some classmates. As we all waded in water up to our necks, I overheard some of them talking about making a retreat at a monastery in Owensboro. They were so excited about it. My heart gave a leap, and as I waded over to them, I said: "I’d love to go with you!" With a great deal of surprise they jokingly responded, "You??" Being an introvert by temperament, I chuckled, because I saw that my plan of keeping my relationship with Our Lord a secret was quite effective! I didn’t want people to know how much I was falling in love with Jesus, because I was afraid of the ridicule I had seen others go through. This was the way I dealt with peer pressure. Well, the day I was to leave for the Passionist retreat house in Owensboro, our car wouldn’t start. Mom and I tried and tried and prayed and prayed until finally it started. Eventually, not a moment too soon, I finally got to the Greyhound bus station in downtown Louisville where my classmates were waiting for me. Then half-way to Owensboro, even the bus broke down, forcing us to wait for another bus to take us the rest of the way to Owensboro!! I have often wondered if the devil was trying to prevent me from going. In the midst of all this, my heart had a steady peace and a kind of certainty that I was on a spiritual journey, but I had no clue as to what was going to happen. I remember looking out the bus window as we left Louisville, and feeling the strangest sense that I was "heading home." At this time, I had no idea of who the Passionist Nuns were, nor that I would ever feel profoundly drawn to their life. When at last we got to the Passionist retreat house in Owensboro it was late, and we were the last retreatants to arrive. The steep walk up the hill toward the monastery entrance was awesome. The grounds seemed cloaked in stillness and peace even though I could hear the noise of traffic from the highway below. Little did I ever dream what a surprise awaited me. As soon as I set foot on the monastery grounds, I knew in my heart that I had found my home, my place in life, my vocation. And yet I had never even known there were Passionist Nuns! God seemed so present on the holy ground of the monastery, and this presence seemed to reach out and envelop me. Throughout the entire retreat, this experience never left me, though I kept it to myself. I didn’t quite know what it all meant. Everything was so new and intriguing, going inside a cloister. It was like going into God Himself. I had always felt drawn to Jesus in His sacred Passion, and here was a whole community of nuns who were totally dedicated to loving Him and bringing souls to Him! I also loved the idea that prayer was so powerful for changing our world, and here was a community who made prayer their work for the Church! Having always loved school retreats, I was greatly attracted by the thought of joining a community that offered retreats to lay people while being strictly cloistered. It all seemed to "fit" what was stirring in my heart. When I got back home to Louisville and resumed my daily life, there were some pretty rude awakenings. It was as if I now had "new eyes" to see through the cheap allurements with which the world tries to dazzle us. I began to feel like a fish out of water, and lost interest in lots of things. I realized I no longer belonged to the world of craving for success, for pleasure, for the money and nice clothes that had so possessed me before. Somehow I was different inside and knew I would never be the same. My life changed forever during that first retreat at St. Joseph’s Monastery in Owensboro. Even my mother commented to me how much I had changed. In about a month, I wrote to the retreat directress, Sr. Mary Bernadette, and told her I wanted to be a Passionist. She told me to get a spiritual director and to keep in contact with the monastery. Not too long after that, I was accepted for entrance the next year. I continued dating young men, because I didn’t want any of my peers to guess the grace that was powerfully moving in my heart. It was a secret between Jesus and myself. As time went on, I found myself drawn to spend more and more time with Him in the Blessed Sacrament. This was easy, as I had a job as a parish organist. I often had a strong, felt experience of the presence of God, even when standing at a busy street corner in downtown Louisville. All seemed to go smoothly until Christmas break, when a great temptation nearly changed the direction of my life forever. My best friend got me a date with a fine young man who was studying at Notre Dame University. I really fell for him, and had a good time that night, not realizing how close I was to losing my vocation. He said he was going to call me for another date, but when I didn’t hear from him after a day or two, I began bargaining with Our Lord. I said rosaries that he would call me for another date, telling myself that after all, a good Catholic marriage was a tremendous vocation. I also began to tell myself that I could serve God well enough by becoming a nurse. "Being a nurse is so selfless. I could do that and remain in the world, and marry and have a family. What a great way to serve God and other people!!" I went on rationalizing…and all the while, Jesus watched and waited and understood me. He knew I had to learn some lessons about my own weakness. All this was happening after I had already been accepted for entrance into the monastery! Finally, when the young man never called back, my infatuation wore off. In a few weeks, I realized how close I had come to throwing away my precious religious vocation. Never again did I get caught like that, although I continued to date until my graduation. After the senior prom, I stopped dating entirely. I had learned a hard lesson about my own weakness, my ability to rationalize, and how easy it is to lose one’s religious vocation. After graduation, I began to let people know that I wanted to be a nun. My faith-filled parents had known for quite some time and they basically supported me, wanting whatever would make me happy. But others couldn’t understand why I was walking away from all that the world offered. My friends respected me, but they didn’t understand why I wasn’t going to use my musical talents. And how could I just walk away from a career and from marriage? The boys I had dated respected my decision, but didn’t think I would really stay in the convent. After I entered the monastery, my mother told me that one boy even kept coming back to visit our family home, hoping that I had left the convent. As for my teachers and classmates, they thought I could easily have a religious vocation, but asked why in the world a cloister of all places?? Once at a family party, my cousin’s boyfriend found out that I was going to enter a monastery, and he said to me: "Why would someone as cute as you, ever want to be a nun?" It must have been the Holy Spirit, but I laughingly said immediately: "Well, do you want Our Lord to have only the ugly ones??" He looked quite astonished. This young man, by the way, eventually became a married deacon. I realized from this that many have no notion whatever of what religious life is about, much less a cloister. My story is as much a love-story as any two people falling in love and planning to get married. Religious life is all about love. It is about preferring Jesus Christ to an earthly lover. This is called a "preferential love." 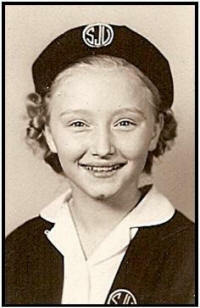 I entered the Passionists as soon after high school graduation as they would take me. The date was August 5, 1961, a day marked with the mystery of joy and sorrow. I felt tremendous joy in finally entering religious life, yet missed my family terribly. I was determined, however, that I would stay with Our Lord "for better or for worse" no matter what it cost me. One day before I entered, I felt worried about my Mother needing me to help at home, since we had so many small children in our family of 10 children. As I was praying about this, it seemed that Jesus said to me: "Kay, come and take care of My family, and I will take care of yours." I immediately understood that He wanted me to work for His Church, and that just like a bridegroom, He would show special care to His bride’s family. Over the years, I have witnessed how faithful He has been to that promise! During my early years in the monastery, many times I cried bitterly from homesickness; many times I wondered if I would make it and also if the community would accept me. These are normal ups and downs for every candidate in religious life, and one can grow strong by working through them. I just kept praying and trying to draw closer to the One who loved me and had died for me. Little by little, the homesickness went away and my family began to be happy about my vocation as well as the tremendous fruits they began to see coming to our family. My prayers and those of my Sisters here in the community have always been a source of comfort and strength to the family at times of joy as well as times of suffering and sorrow. This is part of the hundredfold Jesus promises to one who is willing to leave family and the good things of this world in order to follow Him in religious life. Jesus never makes empty promises. In and through the Heart of Jesus, a cloistered nun is even more present with people outside the community. Each time another of my brothers and sisters got married, people remarked to me that they felt my presence and prayers among them during the Mass and celebration afterward, even though I was not there physically. "God our Father in heaven, You choose and call whomever You will. We now thank You for choosing one of our children to serve the Church as a consecrated religious. We say ‘now’ because at the time You called Catherine, we did not have the faith, trust and love of Abraham as he freely offered Isaac back to You. We happily and freely renew the gift of our daughter to Your Son in Passionist life. Through her example of prayer and sacrifice, joined with her sisters in this Monastery, she has been a rock of strength for our family unity. We beg that all of us will remain faithful to the Church and to serving You in the vocation to which You call each of us. We ask this through Christ our Lord. Amen." Mother Catherine Marie meeting Pope St. John Paul II! God is never outdone in generosity. Sooner or later, He rewards the sacrifices we make in order to follow His will, and that is why a young woman should follow Our Lord’s call to religious life with trust. God’s many blessings will far surpass any sacrifice she makes in leaving her family and the possibility of a career and marriage behind. I found this to be so true in another way: After leaving totally and forever all my music behind and entering a monastery, it never occurred to me that I would ever use my musical skills again, but God had something else in mind. Shortly after my first profession of vows, I was assigned as organist and choir directress. So, what I used to do more or less for myself or to help pay my tuition, I am now doing for the glory of God and to enrich the liturgical life of our monastery and retreat house. God has a sense of humor. Having lived Passionist life for a long time now, I would have to say that although there have been many hardships as in any life here on earth, I have found more joy and satisfaction and fulfillment as a bride of Jesus Crucified than I ever dreamed possible here on earth. This shouldn’t be surprising. Our hearts are made for God. I would do it all over again in a heartbeat. Experiencing firsthand the tremendous grace present in the good Catholic marriage of my parents, I have a deep love and appreciation for the vocation of married couples. I never dreamed that as a religious, it would be my privilege to work closely with married people who belong to the community of Passionist Oblates. They, like my parents, continue to inspire me day after day. If I were to sum up my 50 years in Passionist cloistered life, I would have to say: "His love endures forever." Forever will I sing the praises of His love! Great is His faithfulness. "Greater love than this, no one has---that one would lay down his life for his friends." Jesus is that great Love. and now... "The Rest of the Story"